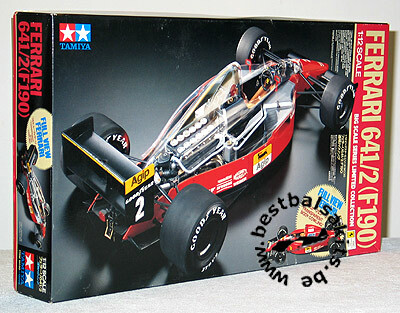 Tamiya Vintage Selection, a Limited Collection kit: the Alain Prost & Nigell Mansel driven Ferrari F190 (641/2) F1 super car. A masterpiece that will stand out in any professional collection. highly detailed static display model, includes both transparent and opaque body cowling, authentic exterior and interior, accurately scaled V-12 engine, die-cast metal suspension arms, semi pneumatic rubber like slick racing tires, functional front & rear suspension.